grade acrylic, you are able to see your flowers in each bead. Created from your flowers, these are candles you don't burn. 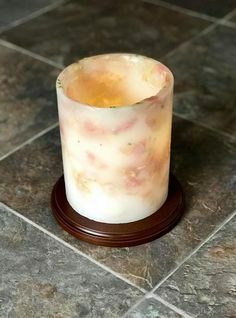 able to place a flicker candle inside. Your flowers are illuminated in a warm glow. from solid acrylic, using petals and pieces from YOUR flowers. jewelry pieces made from petals and pieces. Your flowers embedded into solid acrylic. or placed on a stand. Choose from assorted pendants shapes and sizes, "Pandora" type beads, earrings, bangle bracelets.....so many choices. There are men's gifts. and coming soon, rings and rosaries! The jewelry is made from a special grade acrylic. Each piece is unique. Imagine having a piece made from your wedding flowers, memorial flowers, special occasion flowers. Or have a pendant made using lace from your wedding gown. Just about anything can be done, just ask!!! 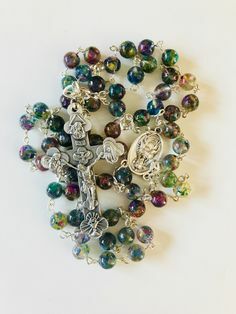 Catholic rosaries handcrafted from your flowers. Any occasion, funeral, wedding, anniversary or any flowers important to you. Made from a high grade acrylic, you are able to see your flowers in each bead. Turning your special flowers into a cherished keepsake that will be passed down in a family, for generations. Your flowers or mementos embedded into solid acrylic, a wooden base is added to make it a beautiful display. Flower size is limited to be able to fit. Embedment, the placing of a flower or other items inside, or embedding, creating a custom piece for you to enjoy. TOTAL ORDERS OVER $250.00, Receive 5% Discount, 10% off $500.00 and 20% off $1000.00 orders!! Hand-crafted keepsakes made from YOUR flowers or keepsakes!!! Your flowers CAN be preserved!!! photo frames, candles, rosaries, ornaments, domes, glass displays and more. Why choose Forever In Time? creating a keepsake that you will enjoy for years to come. cherish it for many years to come. We look forward to working with you!! There are different ways to preserve flowers. Most people have probably taken a flower and let it dry naturally. Then I’m sure it’s not lasted any length of time without crumbling and falling apart. With the price of flowers, and also the sentimental importance of your flowers, be sure to have them preserved professionally. We use freeze-drying, preserving your flowers by freezing them, and removing all the moisture. The completed flower will last for years to come. Depending on the flower, it does take 3-4 weeks. Open flowers such as lilies or daisies take less time, more dense flowers like roses or carnations take more time. They do shrink in size, color can change a bit, but they are still YOUR flowers. The fresher the flower, the better they will preserve. 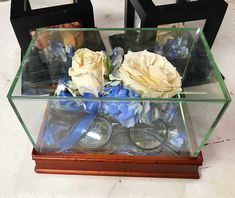 Once your flowers are preserved they need to be enclosed in something to protect them, therefore we do NOT send back unused flowers as we do not charge for the preservation itself. When I started my business in 2004, I mainly did shadowboxes and displays. But in 2010, I added floral jewelry. First I preserve your flowers. Then I take your preserved flowers and create custom floral jewelry. There are so many choices of styles, it’s up to you. They are just fun with all the different colors and styles. But then, when these pieces are made from your keepsake flowers, they are even more special. Imagine, wedding flowers, memorial flowers, bringing home baby, anniversary, the ideas are endless. The jewelry is made from a special grade acrylic. Each piece is unique. Think of it with either flowers from your bridal bouquet, making a piece for yourself, your mother, mother-in-law, attendants, what a beautiful keepsake. The same with memorial flowers. To wear a piece that is made from those special flowers. I’ve even had brides have me make extra pieces, hoping they will have a daughter some day, to give it too. I always think how special it would be to be able to pass down a custom made floral jewelry piece to your children and grandchildren. Please be sure to keep checking back, I’m always coming up with new styles. This is a keepsake that will become a family heirloom. With each bead, you will see the pieces of the petals, and the different colors. What a precious way to display your flowers. Embedments or paperweights are made of a solid acrylic. Placing of a flower or other items inside, or embedding, creating a custom embedment for you to enjoy. 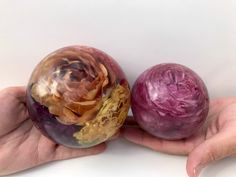 With floral embedments or paperweights, the flowers are first preserved. Then depending on the size of the flower or flowers, you will be given the choice of the shape and size of the embedment you would like. 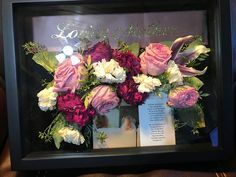 This is another way to safely display your preserved keepsake flower or flowers. As stated, with preserved flowers, they must be placed into something, to keep them out of the elements in your home. Humidity, dust, heat and cold, are all harmful to the preserved flowers. 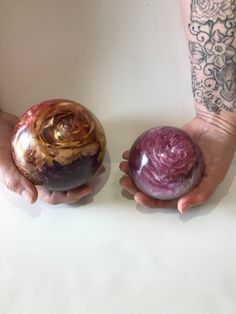 With embedments or paperweights, they will last for many years. We add a wood base to the paperweights, making a beautiful display. This part of my business I also added in 2010, still coming up with more and more shapes and sizes. If there is something you are looking for, please don’t hesitate to ask. I’m more than willing to do something new. These are candles that you don’t burn. They are actually a shell candle that is hollow inside. You simply place a flicker candle inside, and as it’s illuminated , your flowers are seen in a warm glow. Because you don’t actually burn the candle, it can last forever. 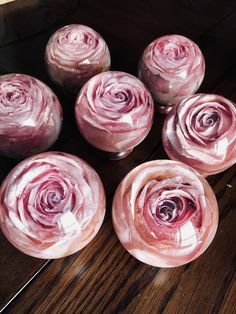 Made from petals and pieces, this is a very unique way to display and keep your flowers. This is one of my favorite keepsakes. I love the idea of your wedding phone, inside a photo frame made from your wedding flowers. This is a beautiful and unique way to display your special flowers, from any occasion. Your preserved flowers need to be placed into something. Domes are available in many different sizes. Obviously, size of the flowers will determine the choices you will have for a display. We work together, creating a beautiful display for your preserved flowers. 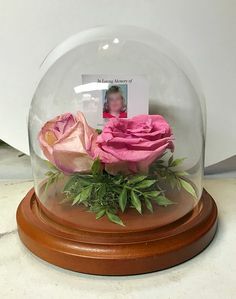 I always have people comment that a wedding bouquet preserved and displayed under a glass dome, looks like something from “Beauty and the Beast”. The main part of my business is floral preservation, but of course, I am more than willing to create something other than floral. What will you do with your flowers? Now you’ll need to make some decisions. Are you going to what a full shadowbox, a dome or display, embedment or jewelry. None of this needs to be decided right now. The main thing is to get the flowers and to get them preserved. Because it takes awhile for them to preserve, you have plenty of time to decide what you want. I’m not in a hurry, it’s up to you. Don’t pass up the opportunity, you only have once chance to have them preserved. Prices vary from $15.00 to $250.00 total. So there is something in YOUR budget. Your flowers have a special meaning to you, why not keep them and enjoy them “Forever In Time”. You’ve planned your wedding since you were a little girl. If you are going to toss your bouquet…toss it my way!! I can do the full bouquet for a dome/display, or a few flowers for an embedment, or individual flowers for jewelry pieces. Photo frames are a wonderful way to display your flowers. Imagine, your wedding photo in a frame, made from your flowers. I love the option of the jewelry pieces. It is so easy. You simply send in a few flowers, think of the colors. You want to send at least one flower of each color. Then you pick the style you like, and I make you a pendant. Then imagine wearing your pendant, having someone ask what it is…to tell them it’s actual flowers from you wedding bouquet. It’s such a perfect gift for the Mother of the Bride, or Mother of the Groom, your Maid of Honor, your attendants….everyone will love it. I even have brides have me make extra pieces, for when they have children. Think of the daughter you have someday….and you have her wear a pendant made from YOUR wedding bouquet at her wedding…as “something old”. It gives me goosebumps just thinking of it. Again, please don’t pass up the opportunity to have your bridal bouquet preserved and turned into a special keepsake. There are so many things to choose from. This part of my business means so much to me. When I started my business in 2004, part of the reason was because I had lost my father, and I wanted to keep flowers from his funeral. I knew because it was so important to me, it would be to others too. And I wanted to be able to give that remembrance to them. Flowers from a funeral have very special meaning. It is a very personal keepsake, and we work together to make a special and unique piece. When I first began, and would be at bridal shows, I’d end up with someone in tears….stating they wished they had heard of floral preservation when they lost a loved one. When I can take these very special flowers, and make a piece that I know means so much to you, I can’t express what it means to me. I know with the flowers I have from my Dad’s funeral, just about every day, as I see them…it might be just touching them, or seeing them….and they bring me such a warm feeling…and the memories along with it. Please allow me to do this for you. There are so many occasions that we receive flowers. Be it the birth of a child, prom, graduation, birthday, anniversary….anything….you can have them preserved. I love the idea, when you have a baby, and the “Daddy” gives you flowers….have a jewelry piece made…or do a shadowbox with the flowers, and the outfit you brought your baby home in. Then with school events, be it sports memorabilia, or first dance revue, prom and graduation. Then from there, it can be 25th or 50th wedding anniversary. There are so many options….you just need to think of them. From memorabilia from a special vacation, your favorite sports team, heritage/antique pieces, or even military keepsakes…turn them into a special shadowbox. It doesn’t have to include flowers. Any of these special items need to be “preserved” and displayed properly. So many of use have items in a closet, in the basement or even in storage….that should be on display. I really try my best to keep the price affordable….just contact me for an estimate. You will be so glad that you finally do something with these items. And again….imagine passing them down to your children and even grandchildren. You will be glad you had it done, and more important….so will they. Me, Tammy Harris. I started the business, but for how much it has grown, both my daughters work with me now too. It’s done in my home, basement and garage. I don’t send the flowers out, so they are safe, everything is done here. My daughter Celeste does the preservation, and my daughter Tiffany does the communication and invoicing. My husband even helps too. I design and make all the jewelry pieces. I’m so proud of what I’ve done and now to have my daughters working with me, amazing. It’s taken a lot of trial and error to perfect what I do. I keep trying to come up with more ideas and options. This is my full-time job….and I love it. I’m not a huge business, and not the most high-tech….but it works for us…and hopefully….for you. Everything I make is hand-crafted. From the custom built shadowboxes, which you choose the frame type and color. To the acrylic paperweights, or embedments, they are hand-crafted, so no two are the same. The jewelry pieces are also hand-crafted. Each are unique, and your personal keepsake. Celeste makes the candles. Tiffany helps create keepsakes when needed. We work together to plan the perfect keepsake for you. Please keep checking back to the website, I’m always making something new. New shapes, new styles. I’m always up for the challenge of making something new. If you have an idea, just ask, and I’ll do my best to try to make it work. Forever in Time can preserve your bridal bouquet or funeral flowers and create a keepsake that you will treasure for years. Choose from Custom Floral Jewelry, Photo Frames, Rosary’s, Paperweights, Candles, Christmas Ornaments, Domes, Displays & more! All made from YOUR preserved flowers!! into a paperweight. My flowers in a paperweight. Flowers made into jewelry. Custom built shadowbox. Flowers displayed in a dome. 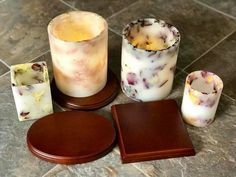 Candles made from flowers, keepsake candles, flowers made into candles. acrylic paperweight. Wedding bouquet keepsake, funeral flower keepsake.